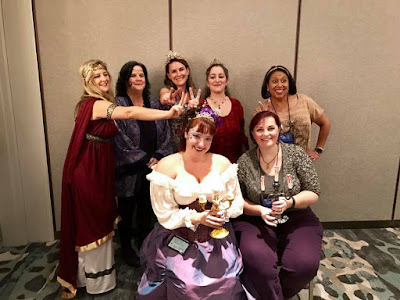 I'm heading back to the Coastal Magic Convention next week. It takes place every year in Daytona Beach (on the beach! with books and authors!) and it is far and away my favorite of all the conventions I go to. For one thing, I get to hang out with the coolest people. One of them is the lovely Alethea Kontis, author, princess, actress, and all-around fun lady. We both write revisioned fairy tales, although in different ways (I love, love, love her books) and she has a fun new book out set in Kristin Painter's shared Nocturne Falls paranormal universe (which is I also love), so I asked Alethea if she would come here today and talk to you about the book, writing in general, and (coff) maybe me. There are more ways to retell fairy tales than there are stars in the sky. Or people on the planet. Our dearest Deborah, as you know, has her own unique take on the infamous Baba Yaga. In my world of Arilland, BY is the proprietor and headmistress of Baba Yaga’s Traveling Home for Unfortunate Young Women with Magical Maladies. Her sister, Anastazia Yaga Vasili, was forced to send her granddaughter there after a wolf attack led to an unhealthy obsession with the Woodcutter who saved her (see: “Hero Worship” from Tales of Arilland). Granted, in my Nocturne Falls Universe, I also have a “Professor Blake” (ahem) who is Head Witch of Harmswood Academy and a kind of fairy godmother to the entire cast. Fairy tale retellings are a unique sort of collaboration. We, the living storytellers, take the framework of tales handed down to us by storytellers from distant (or not-so-distant) lands long ago. To these we add a boatload of personal experiences, a pinch of modern sensibility, and a dash of our own voice. Stir, simmer, and voila! A new take on an old classic is born. I am a writer, yes, but I was raised a storyteller. Some readers can tell the difference between “writers” and “storytellers” subconsciously. The best way to tell is by listening to audiobooks. The storyteller’s novel will come across almost as if it were made for radio. There is a cadence of the words and sentences like poetry. It is inherently pleasing to the ear. Not that books by “writers” aren’t pleasing…the text may be both beautiful and intelligent, but the prose just doesn’t naturally lend itself to performance. Most of the fairy tales you know and love today (and many you never knew or have forgotten) arose from oral tradition, passed down from parent to child at bedtime, or around the fire or dinner table. In many cultures, this oral tradition is born out of necessity. Poverty, diaspora…life can take everything from us, but our stories we keep. My French grandmother was a single mother who raised five kids all by herself in the wild mountains of Vermont on a government salary. My Greek grandmother’s family came over on boats from Greece…and not always under their own names. My Ottoman grandfather was a refugee twice: burned out of his home as a baby in 1922 during the Great Catastrophe of Smyrna, and then forced to become a privateer during the Nazi occupation of Greece. He had to leave two countries and find a new home with little more than the clothes on his back, all before the age of twenty three. Papou died before I was born, but I know his stories because my family told them. My family never stops telling them. It is who we are. It is what we have. The one legacy we were given. My French grandmother remarried later in life—Pepere also died when I was very small, but he left my grandmother with a house and enough money to live comfortably on her own. The Greeks…well, they had the diner, didn’t they? They all worked in the diner. Or at the bar. Or the burger joint. Dad made me promise to never get a job in the restaurant industry. I didn’t realize then that what he really wanted was for me to take my genius brain and break out of the Greek stereotype. I may not have ended up on the same career path as all the other USC Chemistry majors, but I always stayed true to my word. In all my books of Arilland, the fairy tales I retold were from Grimm and Andersen, Mother Goose and Lang. In the Nocturne Falls books, the fairy tales I got to retell were my own. Kai Xanthopoulos’s parent work at Mummy’s Diner. Heather Hayden’s happy place is somewhere on a mountain in Vermont. Owen Liddell was cursed in Egypt as a teenager in the 1920’s…setting him far enough east in the Mediterranean to have crossed paths with Greek and Armenian refugees from the Ottoman Empire. But that’s all worldbuilding—that’s not the story. 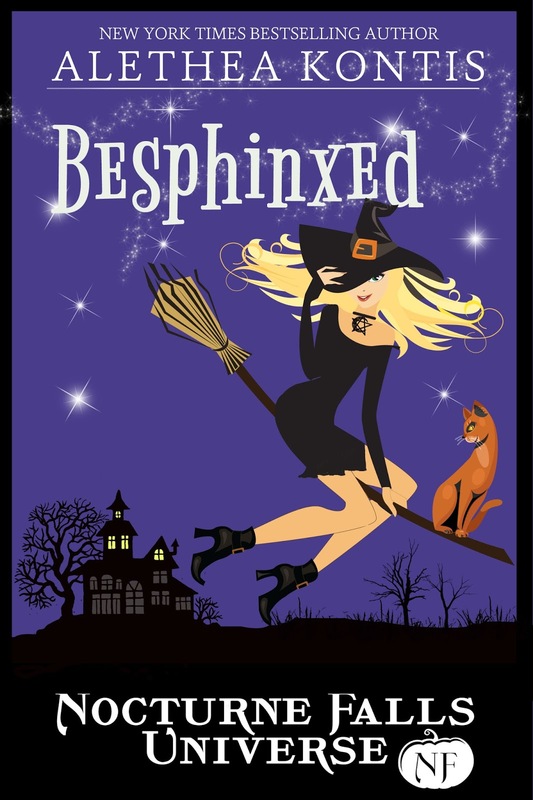 The story of Besphinxed is one of a young woman who is amazing and powerful at heart, but she’s been raised by some truly terrible people, and so believes some pretty horrible things about herself. It’s the story of a young man who was cursed into the form of a cat a hundred years ago, and he hasn’t grown a lot in that century. He’s still a coward, willing to just let life happen around him for better or worse. But they are thrown together by Fate…and it turns out, each was exactly the medicine the other needed. In so many ways, the three books I’ve written in the Nocturne Falls Universe so far have turned out to be exactly the medicine *I* needed. So, Professor Blake...did I get an A on my homework assignment?? You did! Can't wait to see you!